As a Canadian living abroad, I’m sometimes called upon to provide a meal from the old country. Even though the last city I called home in Canada was Vancouver, and about as far from French Canada as you can get, I still have a special place in my heart for that clove-scented meat pie from my childhood. I did grow up in small village close to the Quebec border, and my mum is from Montreal, so we did have tourtière when I was small. It’s generally thought to have been made since about 1600, but to be honest, the meat pie is a typical medieval dish – small pieces of meat, together with vegetables in a pastry crust was found all over Europe. Like those medieval pies, tourtières take advantage of whatever meat is fresh and available. For French settlers in Quebec, that would have been pork, veal, beef, or game meat. The pies I had growing up tended to be all pork, and the dominate seasoning was cloves – from my reading I now understand that to be Montreal-specific, which makes sense. The most recent tourtière I made here in Germany was a pork and beef mixture, with the addition of summer savoury as per the recipe in [amazon_link id=”0997660848″ target=”_blank” ]More Than Poutine, Marie Porter’s book of Canadian recipes for those of looking to recreate some of our favourite things from home[/amazon_link]. The summer savoury makes sense as Porter is from Winnipeg, and that’s a very Manitoban addition. 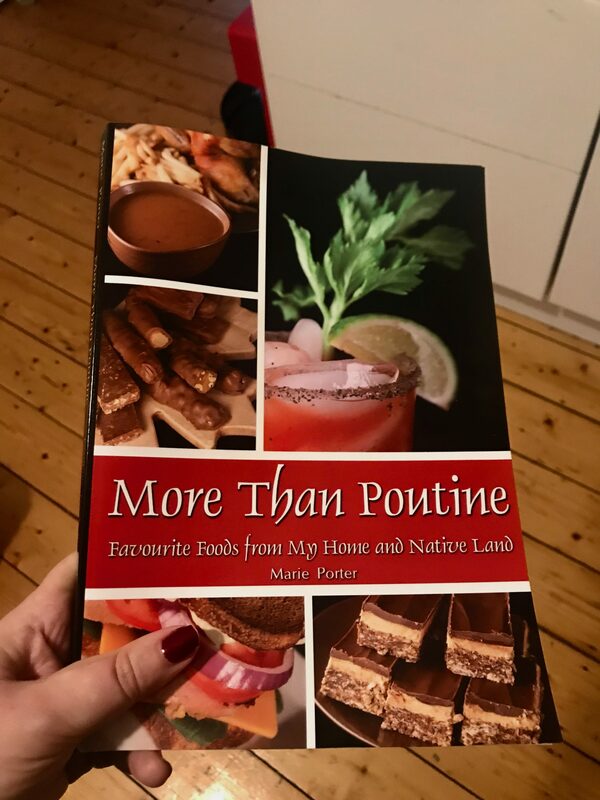 Marie Porter’s cookbook for Canadians abroad, looking to recreate some favourites. If you’re looking to recreate your favourite Canadian chocolate bars or bakery treats (*cough*Jos Louis), this is a handy book to have. However, if you’re from the west coast, like I am (at least partially) a lot of these recipes may not seem familiar. Atlantic Canadians, however, will rejoice I suspect! Regardless, I am happy to have this easy tourtière recipe. 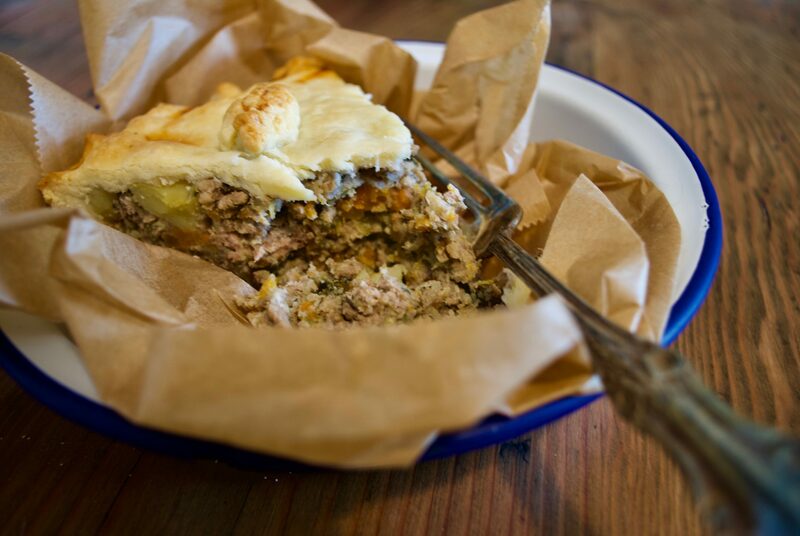 As with most meat pies, tourtière is excellent eaten warm or cold, and makes an excellent addition to any picnic. I personally eat mine with thick slices of sweet and sour German pickles, but it’s great all on its own too. I added allspice in deference to my Jamaican Canadian heritage, but feel free to leave it out if you don’t have it. Never ever leave out the cloves however! I added half the milk and stock noted below in the recipe and found it almost too moist, so I would suggest add half and see how the filling goes, add more if it looks dry. Combine meats, vegetables, and seasonings together in a large pan or pot, stirring until everything is relatively uniform. Add the milk and the broth, stirring once again. 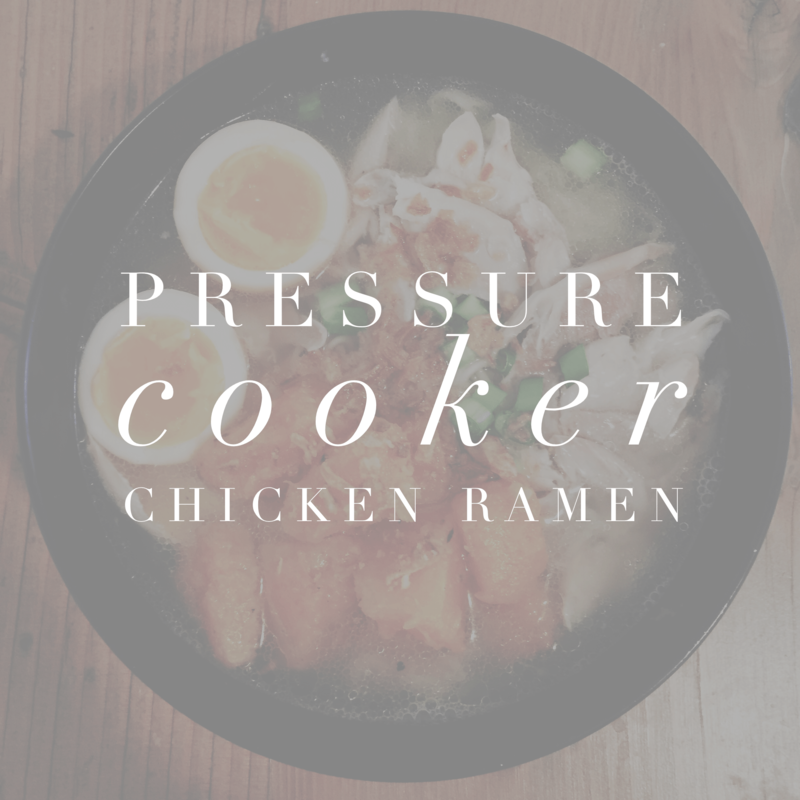 Bring mixture to a boil, then turn the heat down to medium and simmer – stirring often – until the liquid has cooked off, and the meat has broken down almost to a paste. This should take about an hour, give or take. Once it’s ready, remove from heat and cool to room temperature. Line a deep dish pie pan with one pie crust, carefully working it into the corners. Fill pie pan with meat filling, spreading it into the corners and mounding it in the center. Use the second pie crust to cover the filling. Crimp the edges as desired, poke a couple of slits in it. If desired, roll any extra dough very thin, cut into shapes, and apply to the crust for decoration. Whisk together egg and water, brush over the entire top of the pie. Bake for 20 minutes, turn heat down to 190ºC/375ºF and continue to bake for another 15 minutes, until the crust is golden brown. 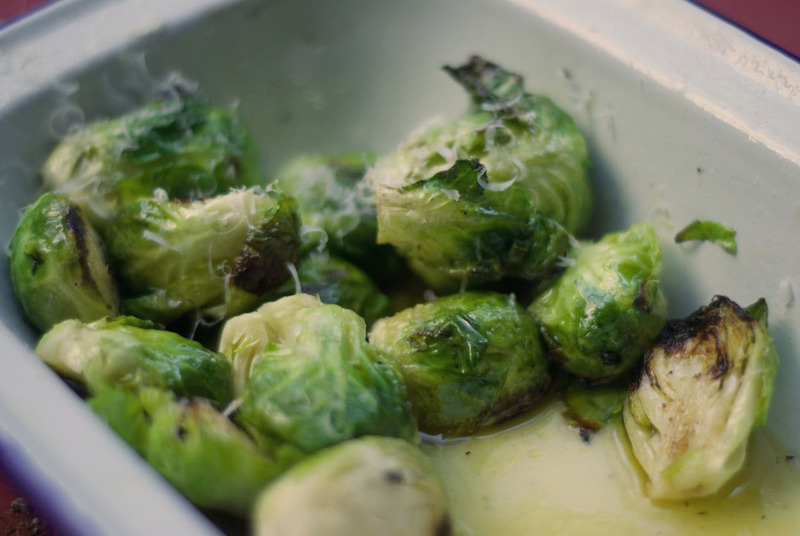 I have an obsession with the crispy brussel sprouts with lemon, parmesan and capers from the wine bar around the corner from our place. A dish of those, their bone marrow cheese toast, and a glass of Viognier is just perfect in my book. Heat and oil your grill. 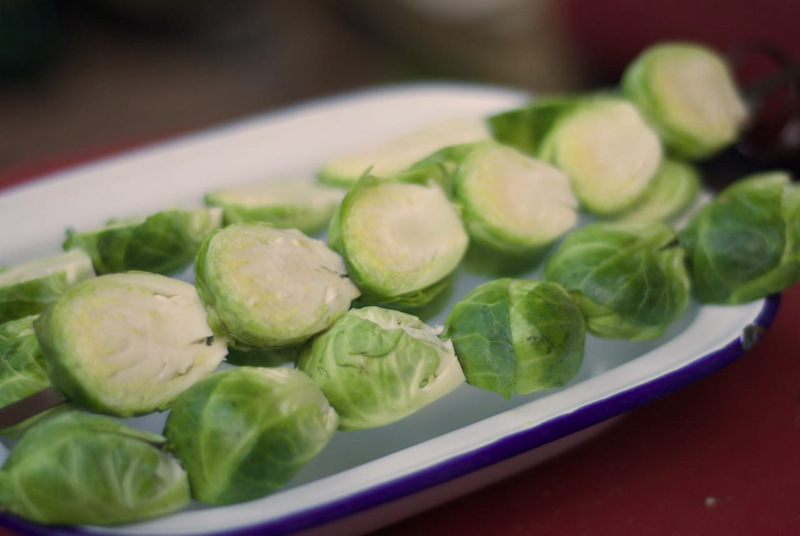 Slice off the base of each sprout, then slice in half. Thread them on skewers, with flat halves all facing the same way. You’ll need quite robust skewers for this, my sharp metal ones came in handy here. Whisk olive oil, lemon juice, and salt together in a bowl just big enough to hold your sprouts. Taste, and adjust salt and lemon as needed. Adjust grill heat to medium. Brush sprouts with oil, place on the grill, turning occasionally. You want grill marks, but they go from nicely marked to decidedly burnt quite quickly. There’s no harm in flipping them often, thankfully. 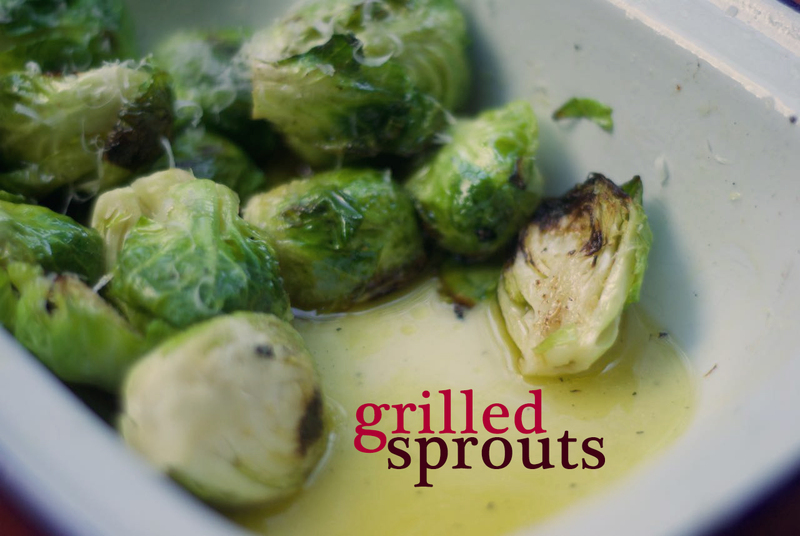 Remove the sprouts from the grill when just starting to become tender (poke with a knife). Using hot mitts and tongs, remove the sprouts from the skewers directly into the dressing and toss. Sprinkle with parmesan and toss again. Serve immediately. As much as I enjoy cooking magazines like Olive, delicious., Cooks Ilustrated, and Cooking Light, I often crave a local Canadian option. There’s Canadian Living and… well, not much else. 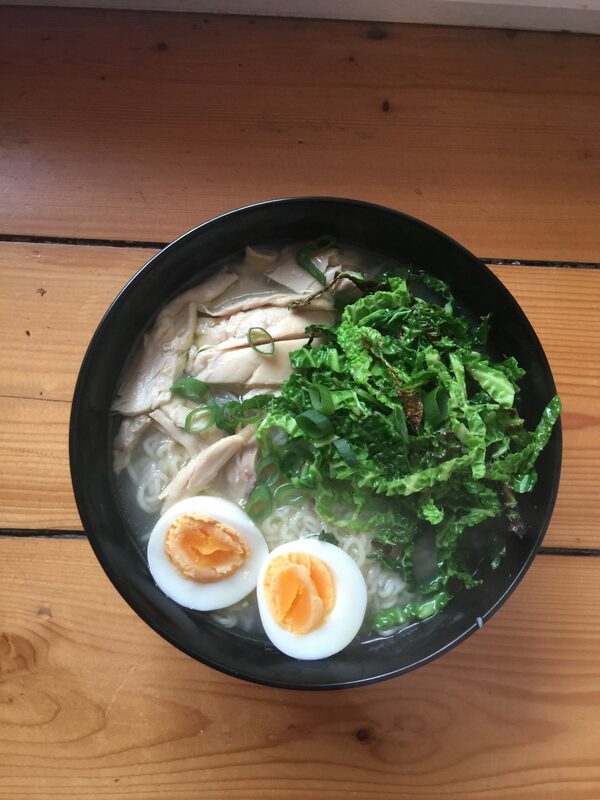 I discovered Ricardo last winter, and I’ve been quite impressed with their recipes. When they asked me to try out one of their chicken recipes and I had chicken breasts in the fridge defrosting that very day, I figured it was fate. I picked the Parmesan-crusted Chicken, because anything involving panko and parmesan is a usually a hit with my family. This dish is a nice alternative to the full job of coating and frying that panko coating usually involves. 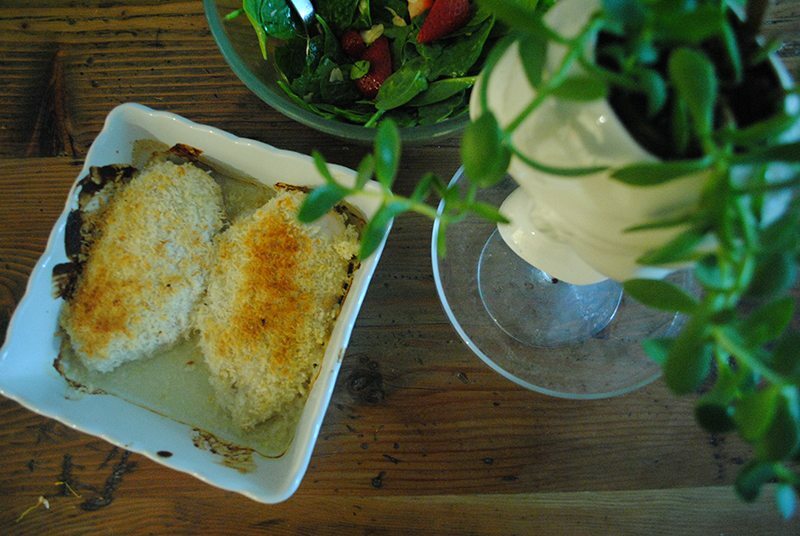 Instead, the chicken breasts are roasted in sour cream and whole-grain mustard, with the panko and parmesan mixture on top. I quickly brined my chicken breasts in a mixture of salt and sugar water for about 10 minutes beforehand, because I find that cut needs it. I have to say, the sour cream really helps with that as well though, as well as giving the chicken a tangy flavour. I think this is my husband’s new favourite. Which is fine with me, as this recipe is really easy to pull together on short notice. Check out the full recipe for Parmesan-crusted Chicken, as well as a huge selection of other chicken recipes from Ricardo magazine. The rhubarb always surprises me. It seems to go from tiny little green shoots to full-fledged leafy green monster overnight. In our communal rooftop garden, luckily I seem to be one of a few who harvests those ruby stalks, but you should be able to find it at your local farmers market or good grocery stores. Rhubarb syrup is simple to make – minimal chopping and little cooking. It’s an incredible pink colour, and looks amazing on ice cream, swirled in yoghurt – instant pink joy! Put sugar and water on to boil over high heat in a large pot (the rhubarb will foam, so you need room). Once boiling, add your chopped rhubarb and boil for 2 minutes. Take off the heat and let cool completely. Decant into a clean jar, store in the fridge. Add ice to a highball glass. Tear several mint leaves into small pieces and sprinkle over ice. 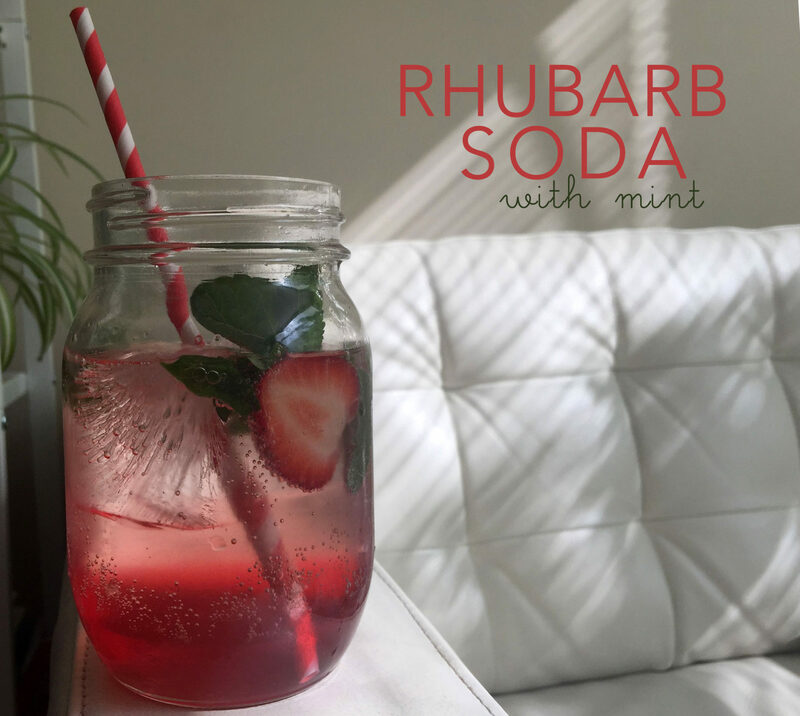 Add 2 to 3 tablespoons of the rhubarb syrup, and top up glass with soda water, adjust sweetness to taste by adding more syrup. Slice strawberry in half and tuck down in the glass just below surface of the liquid. Sprinkle a few more pieces of mint, or a few whole leaves. Enjoy!